WASHINGTON — Com­mands through­out the Navy are cel­e­brat­ing Asian-Pacif­ic Islander Her­itage Month dur­ing May, and two Navy offi­cers are serv­ing as prime exam­ples of the diver­si­ty found with­in the Navy’s ranks. 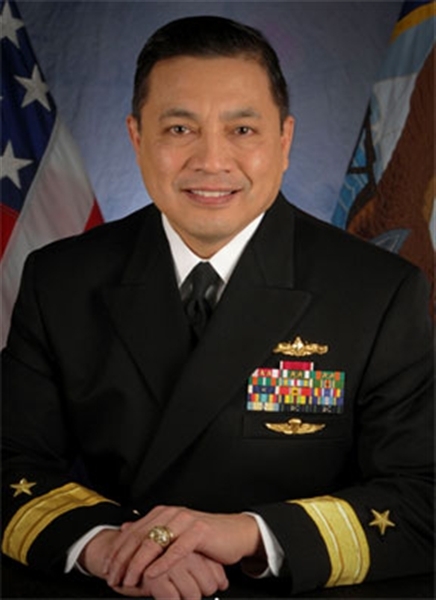 Navy Rear Adm. Ana­to­lio B. Cruz III is deputy com­man­der, U.S. Naval Forces South­ern Com­mand and deputy com­man­der, U.S. Fourth Fleet. Navy Capt. 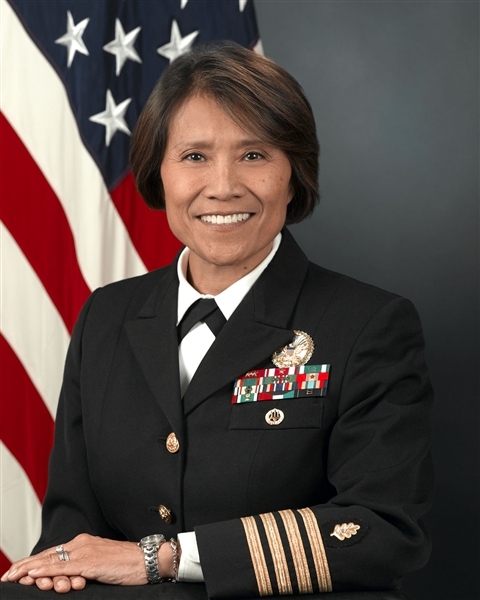 Raquel C. Bono, sis­ter of Navy Rear Adm. Ana­to­lio B. Cruz III, was nom­i­nat­ed in April for pro­mo­tion to rear admi­ral. Capt. Raquel C. Bono was nom­i­nat­ed in April for pro­mo­tion to rear admi­ral. Her broth­er, Rear Adm. Ana­to­lio B. Cruz III, is a Navy reservist who was pro­mot­ed last year. They will be the only sib­lings of Fil­ipino descent to hold flag-offi­cer ranks simul­ta­ne­ous­ly. Bono and Cruz’s grand­fa­ther – an obste­tri­cian in the Philip­pines – was com­mis­sioned as a U.S. Army colonel and sup­port­ed his coun­try­men in their fight against the Japan­ese dur­ing World War II. Some 20 years lat­er, their father and moth­er left Mani­la for Min­neso­ta, where their father com­plet­ed his sur­gi­cal res­i­den­cy. The fam­i­ly ulti­mate­ly set­tled in San Anto­nio, Texas. Their father went on to serve in the Navy Reserve, even­tu­al­ly retir­ing as a cap­tain. Bono, the old­est child, enrolled at the Uni­ver­si­ty of Texas and con­sid­ered becom­ing a nurse. Her father asked, “Why not be a doc­tor?” she recalled. In the ques­tion, she said she heard a les­son: if she believed in her­self, she could accom­plish lofty goals and serve oth­ers, too. So, through the Navy’s Health Pro­fes­sions Schol­ar­ship pro­gram, she earned her med­ical degree at Texas Tech and began her mil­i­tary career with a gen­er­al surgery res­i­den­cy at Naval Hos­pi­tal Portsmouth, Va.
She was the first woman to grad­u­ate from the pro­gram. Cruz, one year younger than his sis­ter, grad­u­at­ed from the Naval Acad­e­my in Annapo­lis, Md., 1980, and in the fol­low­ing year report­ed to USS Gray, where he was the only minor­i­ty offi­cer. In 1982, he earned the Pacif­ic Fleet Shiphan­dler of the Year Award. In 1984, Cruz returned to Annapo­lis as an admis­sions and con­gres­sion­al liai­son offi­cer. He trans­ferred to the Navy Reserve two years lat­er, but remained close­ly involved in acad­e­my admis­sions for the next 22 years, with a par­tic­u­lar inter­est in pro­mot­ing diver­si­ty. “I’ve seen first­hand the strides we’ve made over the years,” he said. Cruz spent most of his career in spe­cial oper­a­tions assign­ments and com­plet­ed six com­mand tours. Units he com­mand­ed earned the Leo Bil­ger Award for mis­sion effec­tive­ness and the Mer­i­to­ri­ous Unit Com­men­da­tion for excep­tion­al per­for­mance. Regard­less of those accom­plish­ments, he said he has always been in awe of his sis­ter. “She was the smart one and very dis­ci­plined at every­thing she did,” Cruz said. “Dad set the bar and she raised that bar. Quite frankly, she deserved to make flag before I did.” After three years as com­mand­ing offi­cer of Naval Hos­pi­tal Jack­sonville, Fla., Bono became chief of staff of the TRICARE Man­age­ment Activ­i­ty in Sep­tem­ber 2008. In 2010, she became the deputy direc­tor of med­ical resources, plans and pol­i­cy for the chief of naval oper­a­tions. Cruz has been U.S. Naval Forces South­ern Command’s and U.S. 4th Fleet’s deputy com­man­der since Feb­ru­ary 2010. They talk fre­quent­ly, often about mil­i­tary top­ics, and while Asian-Pacif­ic Islander Her­itage Month comes around just once a year, they find sup­port for their Fil­ipino-Amer­i­can her­itage every day, Bono said.